Tin Lizzy’s menu prices are here. Tin Lizzy’s is a highly differentiated, full-service restaurant and bar that serves delicious cuisine and wonderful drinks in a very welcoming environment. Tin Lizzy’s offers more than just a dining room away from home. The restaurant’s atmosphere sets a stage for a memorable dining experience with factors such as lighting, music, spacing, and artwork perfectly combined to create comfort for all guests. Tin Lizzy’s sets high standards for their food quality and are keen to ensure guests receive the same quality with every meal. They offer genuine services to their guests while their knowledgeable and friendly staff serve as a reflection of the restaurant’s culture. Below are the latest Tin Lizzy’s menu prices. Other than treating all their guests as ”friends being served by their fellow friends”, the other thing that sets Tin Lizzy’s apart from the rest is their superior execution of food and drinks at such competitive prices. They have a unique menu that is referred to as ”FlexMex”. FlexMex is a cuisine that resembles Tex-Mex but is influenced by and comprised of many cultures. The menu features numerous delicacies including tin dips, starters, tacos, skillets, quesadillas, salads, sides and various drinks. The kids’ menu features chicken fingers, fish sticks, taco plate and cheese quesadilla. Every kid’s meal comes with a soft drink and a treat. Tin Lizzy’s unique FlexMex cuisine impressed many people and many neighborhoods wanted it brought to their area. Tiny Lizzy’s decided to take their FlexMex cuisine to these neighborhoods. You can order catering from any of their locations. Anything from appetizers, buffets, salads, sides to deserts will be brought to you. Tin Lizzy’s was started by four college friends who identified a restaurant opportunity in Georgia and acquired a restaurant to test their concept in 2005. The restaurant has grown into numerous locations and has become a popular place to work or meet up with friends to enjoy refreshing margaritas and tasty FlexMex cuisine. 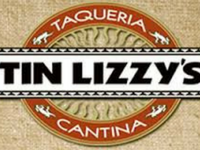 For more information about Tin Lizzy’s, visit their official website.